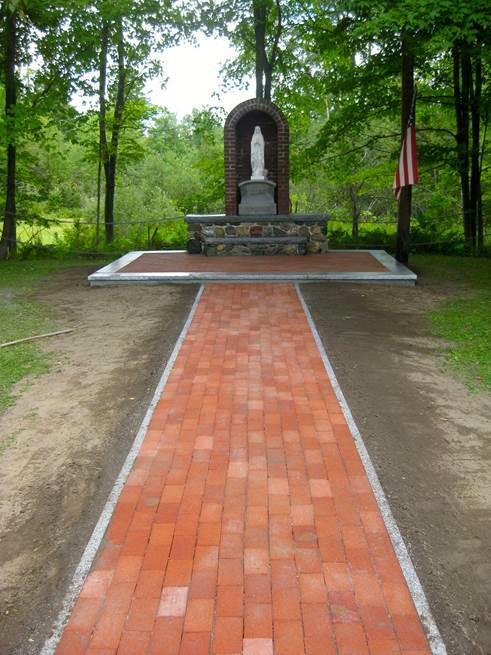 The Caddy Memorial is located on Route 302 in Maplewood, New Hampshire. In the mid-1950 several former campers Lou Cavagnario Sr., Connie Dennehey, Boots Indrisarno, Sal Lunetta, Ralph Marino, Andy Marroita, Gito Passcucci, andTony Russo were instrumental in the construction of the Memorial, which was completed in 1958. Soon afterwards a picnic table and trash receptacle were added for those travelers who stopped during their journeys. Booklets for written notes have consistently been available; often the weather results in damage to what is written. Initially several of the above oversaw the maintenance of the caddy memorial; however, Sal Lunetta, who often summered in the area, was the dominant care taker. Donations were accepted and the minimal expenses incurred were all paid by Sal from donations. In the early 1980’s Helen Cunningham, Mr. Lunetta’s daughter, assumed all of the responsibilities of the “The Lady of the Fairway” memorial and the trust. Mr. Lunetta died in 1989. In 1998 Helen and her husband Fritz oversaw both the re-doing of the area in and around the statue and the 40-year celebration of the “Lady of the Fairway.” Mrs. Cunningham continued accepting donations and the paying of expense from those donations until January of 2008. In 2008, the Knight of Columbus accepted the transfer of title, the then available funds and the responsibilities of maintaining the property and the trust. Kevin Hastings, Stephen Noyes and Al Michaud have been the trustees of the trust and have also overseen the perpetual maintenance of the Caddy Memorial. In 2004 Laura and Peter Dolloff purchased the old Franzeim property including the house, once called the Harris Lodge and renamed by Mr. Franzeim to The Lodge. In the last few years, Fred Forte and Peter Walsh updated much of the masonry and started the replacement of bricks with bricks engraved with camper names. Fred and Peter’s work was significant and after more than 50 years of existence was very much needed.